Guest blog: Australia – it’s for the birds! One of the joys of visiting Australia (other than seeing Lisa and Dan) is the bird life. There are unique and interesting birds just about everywhere you look. It’s a very odd thing, at least to me as a Canadian, to witness a group of large white Sulphur-Crested Cockatoos hanging out in a big tree or to see a chattering flock of Crimson Rosellas zooming by. In North America, we are only used to seeing these kinds of birds in cages so to see them in their natural environment is amazing. 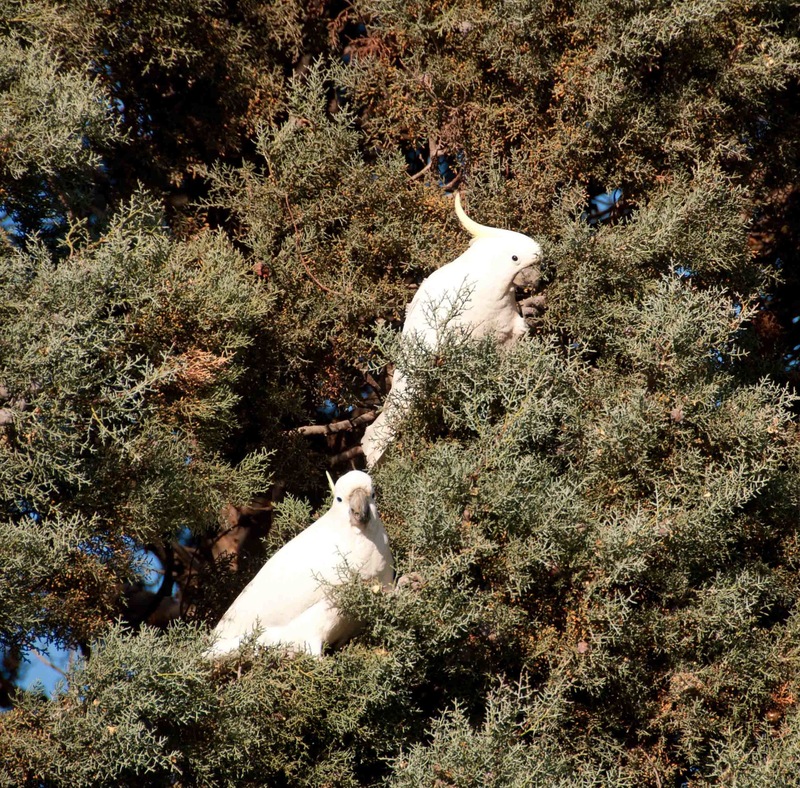 Here are some sulphur-crested cockatoos feasting on nuts in a tree. The bird that many people associate with Australia is the Kookaburra. I haven’t actually seen one on this trip (although I did see them when I lived in Papua New Guinea) but I’ve certainly heard them “laughing”. Just as the song says, “Kookaburra sits in the old gum tree, Merry merry king of the woods is he”. It’s absolutely true – they do tend to sit high up in the gum trees and they do have a very laughing call. However, because they are so high up much of the time, it’s hard to see them. So far, I’ve seen about 40 new species of birds, and that is just being out and about in Wagga and Canberra, without trying too hard. Among the ones I’ve seen are Superb and Variegated Fairy Wrens, which, true to their name, behave just like House Wrens back home, darting about and singing noisily with their tails stuck up into the air. You can’t miss the Australian Magpies, which are large black and white birds present just about everywhere, and they have a surprisingly melodious and pleasant song, unlike magpies at home. Also very common are the Galahs, which are really pink and grey cockatoos, about the size of a crow. They hang out in flocks and like to graze on people’s lawns, so you often see them in the suburban neighbourhood where Lisa and Dan live. Many Australians think they are a rather stupid bird but a friend of Lisa’s who had us over for dinner has one as a pet and she insists they are very intelligent, despite what the average person may think. 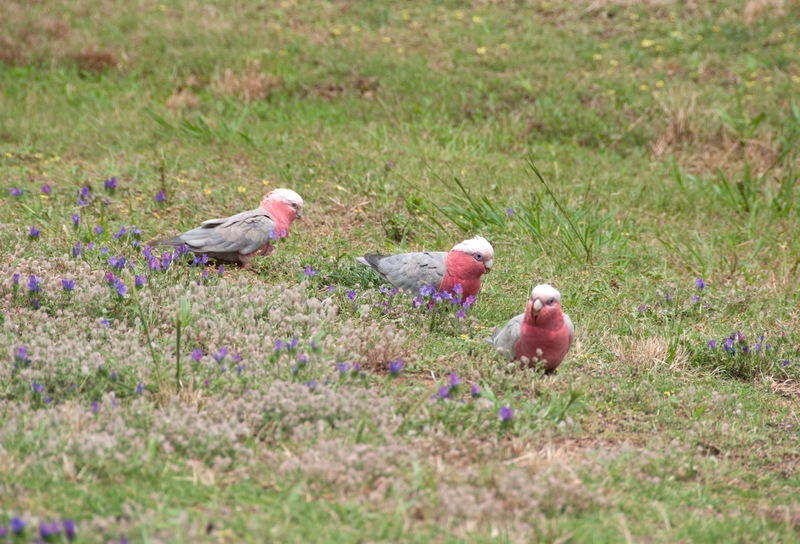 Australia's version of the lawn ornament - only these ones (Galahs) are alive! It’s a bit of a challenge for Australians to appreciate some of the birds they have here because they are often regarded as pests. For instance, Sulphur-Crested Cockatoos can be very destructive, particularly in orchard areas. They arrive in large flocks and can decimate a fruit crop if the farmer doesn’t keep them away. They have extremely strong beaks and can chew through just about anything, including the wood on people’s homes. If a flock of them starts to chew on your house, you need to take immediate action or you may find the outside of your house is just a shell of its former self. Because they are so large and tend to travel in flocks, Sulphur-Crested Cockatoos aren’t afraid of much so scaring them off by shooting at them usually doesn’t work. 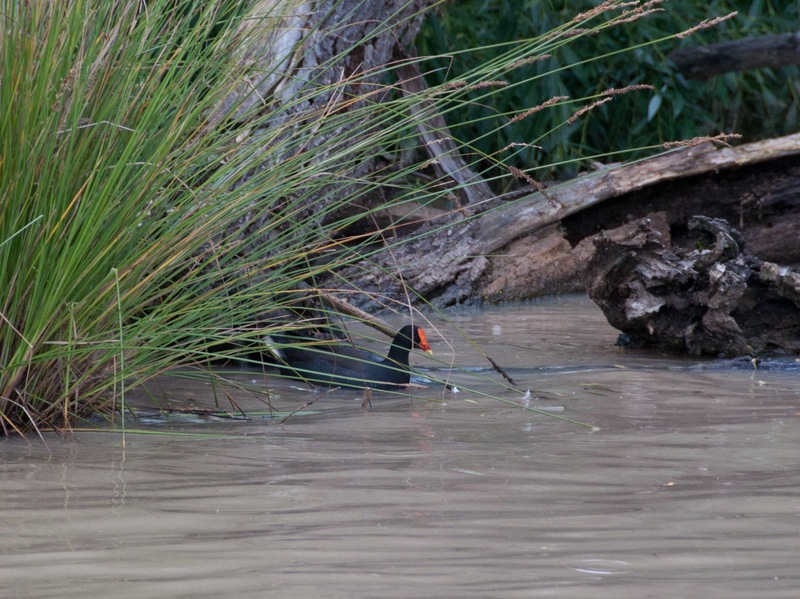 Lisa and I went for a walk around a small lake in Wagga and saw Dusky Moorhens, which look very much like North American Coots, and Swamphens, which are spectacular large wading birds with lustrous purple feathers and a bright red wattle on their faces. We encountered some Australian Shelducks (which look like North American Black Ducks), Australian Wood Ducks (which are basically brown and grey so not nearly as colorful as our Wood Ducks at home) and Cinnamon Teals. We also saw Plumed Honeyeaters, which is a class of birds that we don’t have at home. There are all kinds of honeyeaters, and they love to feast on the nectar of indigenous Australians flowering shrubs/trees like the Banksia and the Bottlebrush, which are both pretty spectacular plants with large brush-shaped flowers. 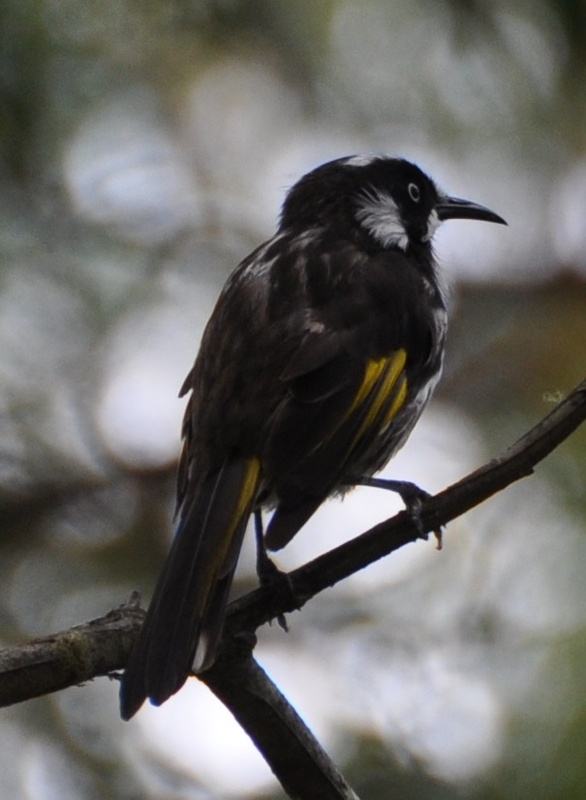 In the Canberra Botanical Gardens, Lisa and I saw another honeyeater – the New Holland Honeyeater, which has flash of bright yellow on its wings. In those gardens, we also saw an Eastern Spinebill, which is like a honeyeater but much smaller. It has a very long curved beak for inserting into the flowers so the closest bird we would have at home is a Hummingbird. The Spinebill, however, does not have the hovering capability of the Hummingbird so it isn’t similar in that sense. Lisa and I saw this New Holland Honeyeater at the Botanical Gardens in Canberra. Very exciting! What else have I seen? There are many varieties of doves/pigeons, such as Crested Pigeons, which as their name implies, have a magnificent crest, much more prominent than on our Cardinals at home. Crested Pigeons love to sit on the house roofs or on wires so they are a common sight. There are also finches (such as the Red Browed Finch, which we spotted in Canberra) and of course, the totally ubiquitous House Sparrows which have been introduced to Australia just as they have back home. There is also a group of birds called Pardalotes, which have no North American equivalent. They are about the size of a sparrow with a similarly conical beak but are far more colourful than sparrows generally are. As well, there are birds called Fantails, which as the name implies, like to fan out their tails as they are hopping about in the trees. They can put on quite a display if they can sit still long enough for you to get a good look. One of the most common and endearing birds who fans his tail is the Willy Wagtail, which, as the name implies, wags his tail up and down in addition to fanning it. You see wagtails frequently in all kinds of habitats. Before I came here, I didn’t know that Australian birds migrate, similar to our biannual migrations at home, but on a smaller scale. After all, I thought, why would they need to migrate, because Australia doesn’t have the severe winters that we have at home. Nonetheless, it’s all relative, and in the Aussie winter, things definitely do cool off, so some of the birds who don’t tolerate the cold as well do migrate north to the warmer regions. As well, some birds, such as the honey eaters, migrate as the flowers bloom seasonally. So you might see them frequently when certain plants are blooming, and then you won’t see them again until those plants bloom again several months later. This dusky moorhen lives at Lake Albert. The waterbirds don't mind the floods! I have to say, though, that the most exciting thing on a daily basis is to see the various types of parrots, rosellas and cockatoos, which are just a natural part of the environment. At the university in Wagga, where I have been working for a few weeks as a visiting scholar, on any given day you could see Eastern Rosellas on the lawns, Crimson Rosellas, Yellow Crimson Rosellas (which is a different race and are basically yellow instead of Crimson), Sulphur-Crested Cockatoos, and Blue-winged Parrots flying about or hanging out in trees. It’s a riot of colour and sound. But that’s Australia – it’s for the birds! This entry was posted in Australia, birds, Canberra, cockatoo, galah, honeyeaters, parrots, Riverina, wagga. Bookmark the permalink. 1 Response to Guest blog: Australia – it’s for the birds! The Galahs are seen as being dumb for their habit of committing mass suicide by flying directly across your path while you are driving.They will be safe as houses on the other side of the road, when all of a sudden ….at the last moment they will all take off and cross straight in front of you and if by luck you dont hit any of them, they will turn around and do it again…..something to remember when you go driving….especially at harvest when they are so full of grain they can hardly get off the ground!